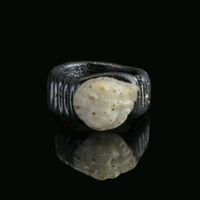 Silver ring with traces of original gilding. The bezel is formed as a pair of clasped hands, since Roman times a symbol of pledging vows. In Medieval and Renaissance Europe they were used as betrothal or marriage rings.